So last week we bought a deep fryer. I'd been wanting one for quite a while -- it was even on our wedding registry, but we didn't receive one -- and so I decided to use a gift certificate to buy (it helped that it was on sale). I felt very modern looking up its Amazon reviews on my iPhone right there in the store (don't judge me, I've only had the smartphone since March, and am only just starting to appreciate its useful functions aside from tracking me at all times, which I've actually found to be quite useful in monitoring my new workout regimen). 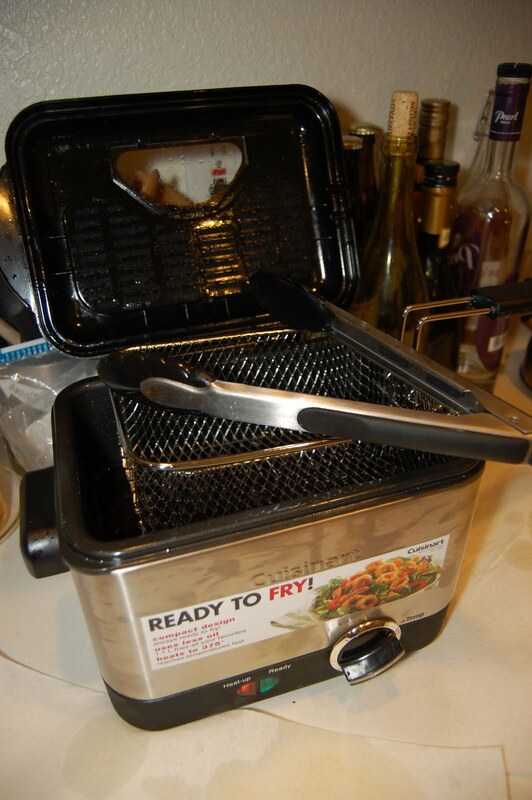 So we bought a 1.1 liter Cuisinart deep fryer, which seemed like a good size for two of us. Last Saturday night I deep fried everything in the house that seemed appropriate, and a few things that didn't (Triscuits = NOT good deep fried). It's hard to stop once you start. Some things turned out excellent, including the spicy pickles I canned last year that I am seriously looking forward to tempura battering and cooking in the awesomeness that is hot oil. I might even get some of those delicious refrigerated grocery dills, just so I can eat them deep fried. With whole-grain mustard. I would be tempted to say OMG if it weren't so teenage girl. But tonight, I used Nasoya wonton and spring roll wrappers I bought this week with great aspirations. Tonight, I got pineapple, mushrooms, cabbage, carrots, ginger and bean sprouts, and added some ground pork, garlic and about half a dozen different underused Asian sauces, in various combinations. The pork, mushrooms, ginger and garlic (with soy sauce and Mongolian Fire oil) I sauteed in one pan, and the julienned carrots and cabbage with sesame seeds and sesame oil in another, so I could play with proportions. But the ones at the right temperature turned out AWESOME. Seriously, they were equally as good as anything I've had at a restaurant, and I'm not one to equal my skills to any professional chef's. Y'all need to try this. 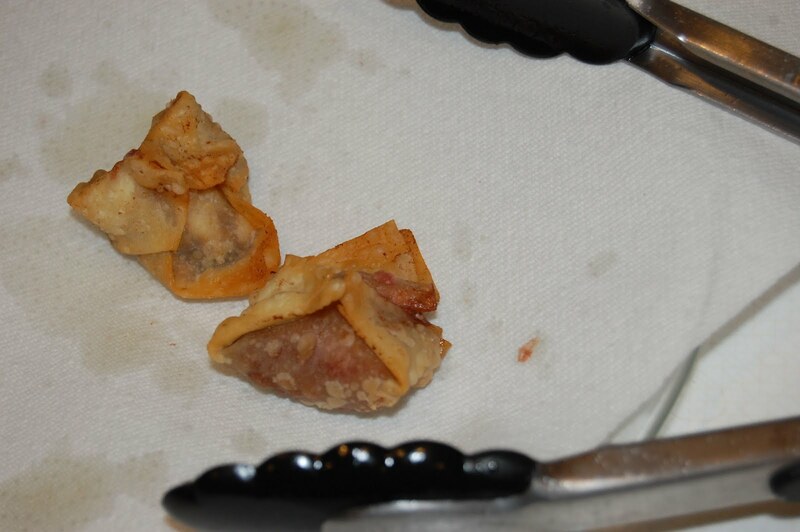 Oh, I nearly forgot to mention -- the wrappers hold up best if you very lightly moisten them before adding filling; just a finger dipped in water and rubbed across the interior surface of the wrapper significantly increases their ability to hold up during wrapping and frying. And if you don't end up with holes in the wrapper, a lot less oil gets into your filling, which makes them easier to drain and not taste "oily." 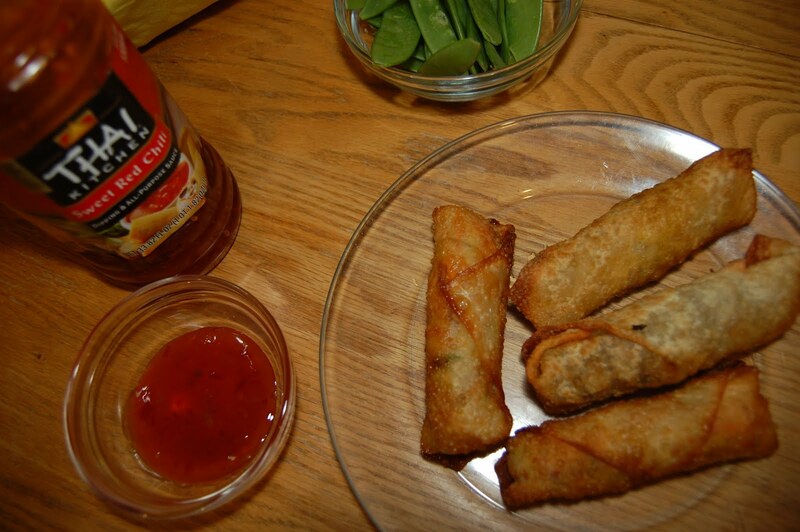 The various fried bits, dipped in Thai Kitchen Sweet Red Chili Sauce (thank you, Costco! ), totally filled us up, but I wasn't quite done yet. 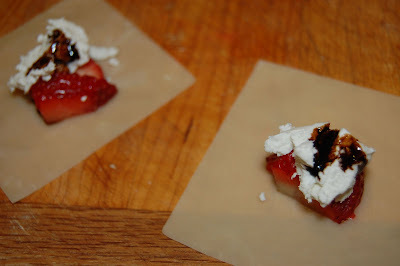 So I julienned a fresh strawberry and added a little bit of goat cheese and balsamic reduction, wrapped all that up in a wonton and did one final fry. I think it would have been significantly better with cream cheese, as the goat cheese was too grainy, but still, a perfect end to my first truly successful deep frying experience. Anyone have any excellent deep frying experiences/recipes they want to share? I'm eager to do some fish & chips, panko-breaded stuff, etc!